The PyeongChang Winter Olympics Torch arrived at the SNU Kyujanggak welcomed by SNU president, faculty and students. 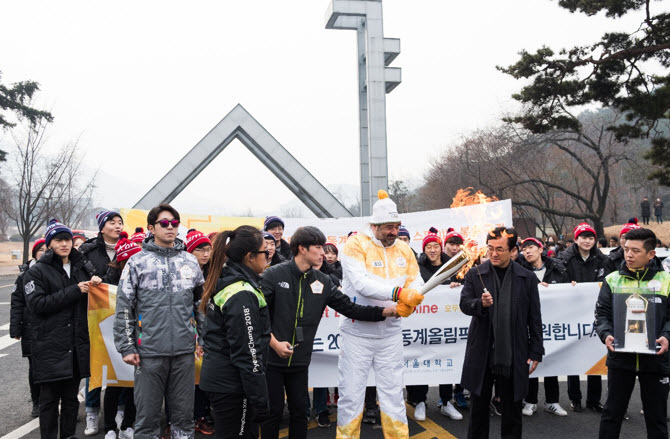 During the course of its nationwide tour which began November 1, 2017, the Olympic torch visited SNU’s Gwanak Campus on January 16, 2018. 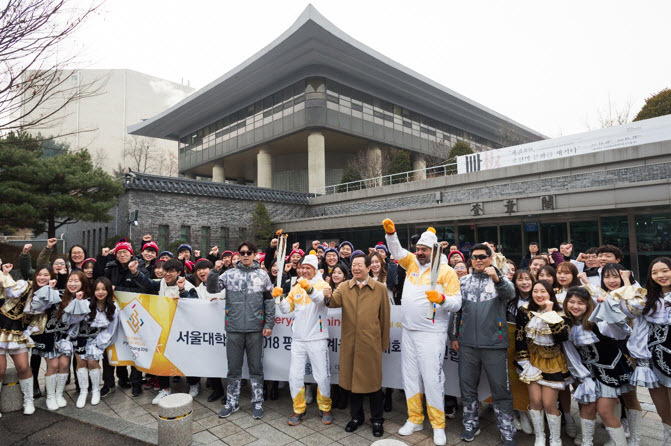 SNU was added to the itinerary of the Olympic torch relay as a representative of all the universities of Korea. The Olympic torch was lit in front of SNU’s main gate at 10:30 am. Professor Lee Kyung Soo of the Mechanical and Aerospace Engineering Department, who is currently taking part in the development of the autonomous vehicle, performed the lighting on behalf of the school. The torchbearers on this day were Yiannis Exarchos, CEO of the Olympic Broadcasting Services (OBS, the permanent host broadcast organization created by the International Olympic Committee) and OBS official Arvelo Richard. Alongside these torchbearers ran 30 SNU students hailing from Gangwon province, the site of the PyeongChang Games, and representing various departments of the university. The torch was carried from the SNU main gate to the Kyujanggak institute. 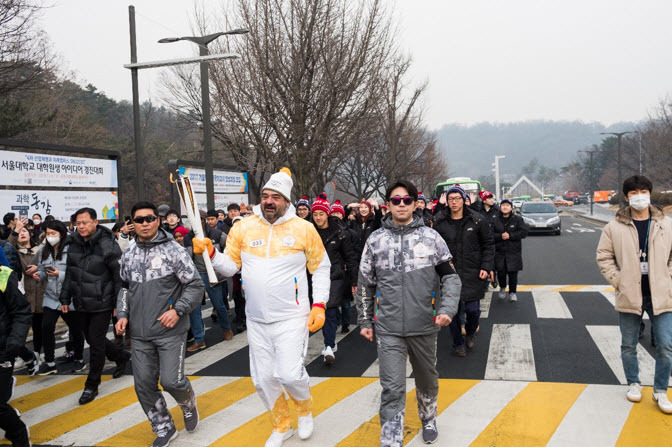 A member of the PyeongChang 2018 organizing committee said that of the many legs of the torch relay, this was the longest stretch with the largest number of runners participating. The leader of the torch relay organizing committee expressed the importance of this visit to SNU, saying that SNU represents more than just the universities of Korea but the very intellect of the country itself.